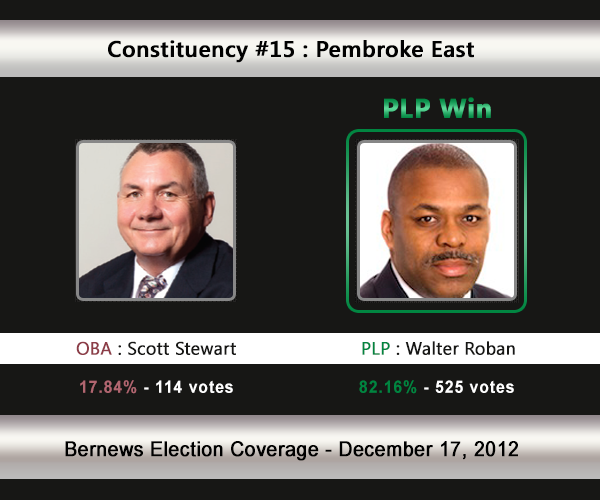 [UPDATE Dec 17: Election Results] Incumbent Walter Roban [PLP] romped to victory in C#15 Pembroke East, one of the safer PLP areas. He was challenged by Scott Stewart [OBA]. Constituency #15 Pembroke East will see the incumbent Walter Roban face a challenge from political newcomer Scott Stewart [OBA]. In 2007, Mr Roban earned 81.63% of the vote vs the UBP’s Sean Pitcher [631-142]. In the 2003 General Election, Ottiwell Simmons [PLP] won with 82.95% of the vote against Walter Cross [UBP] who received 17.05%. 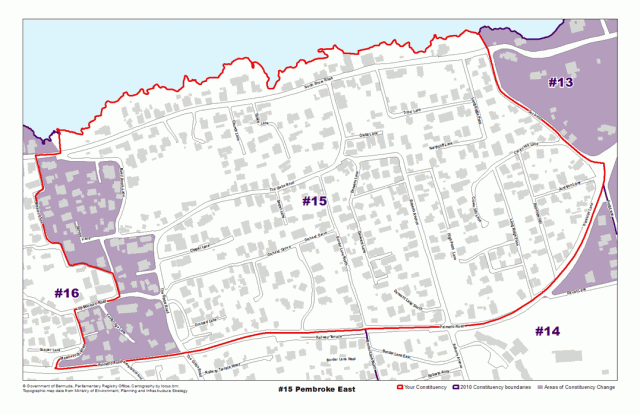 The areas Pembroke East consists of, or are located by, include Glebe Road, Band Room Lane, North Shore Road, Barkers Hill, the Railway Trail, Palmetto Road, Parsons Lane, Old Military Road, Frog Lane and more. The Hon. Walter H. Roban, JP, MP was first elected to office December 18, 2007. On June 7, 2012 he was appointed Minister of Transport. Previously, Minister Roban held the portfolios of Environment Planning and Infrastructure Strategy and the Ministry of Health. He served as Junior Minister of Labour, Home Affairs and Housing from February 2008 and was appointed to Cabinet June 23, 2009 as Minister Without Portfolio. Mr. Roban is a graduate of Morehouse College in Atlanta, Georgia, where he received a Bachelors Degree in Business and International Studies. He then furthered his studies at the University of Birmingham in England where he received a Masters of Arts Degree in International Studies, specialising in international politics, political risk and foreign policy analysis. He has worked in the legal profession and also in the banking industry, most recently as an Assistant Vice President in the Private Banking Division of HSBC Bank in Bermuda. A young man with a passion for politics and the community, he joined the Bermuda Progressive Labour Party Youth Wing, “Progressive Youth”, in the late 1980’s. He served as its Chairman and representative to the party’s Central Committee from 1991 to 1993. In 1995 he was elected to the position of Secretary General of the PLP, which he held until August 1999. In 1995, Mr. Roban worked on the team that revised the PLP independence policy. Ten years later in 2005, he was selected to chair the Committee that was responsible for drafting an update of the Bermuda Progressive Labour Party’s policy on Independence which was submitted to the Bermuda Independence Commission (BIC). Mr. Roban served as deputy chairman of the PLP Campaign Committee for November 1998 election, playing a key role in all aspects of the historic national election campaign. In 2003, he was appointed to the PLP’s Executive where he held the positions of Acting Secretary General Membership and Acting Public Relations Officer. In addition, he was spokesman for the election campaign as well as a Campaign Committee member. Mr. Roban is a former government Senator and held the Junior Ministerial portfolios of Health & Family Services, Tourism & Transport and Education and Development, serving in the Senate from 2003 to 2006. Saddened at having become a debtor nation, Scott Stewart, never a member of old political parties, has stepped into the arena in the hope that through good governance tomorrow will be better. Focusing on gaining control over spending and providing young people opportunity so they are invested in the future, Scott also believes that we have a responsibility to provide seniors with the necessities to live the remainder of their lives with dignity. Previously the manager of Sun Control Company, Scott is now the owner- manager of Summerside Guest apartments and serves as Chairman of the shadow Tourism Board leveraging his extensive knowledge of the hospitality industry. His success and leadership in business bring the skills needed to renew and manage Bermuda’s economy. Beside Scott’s business interests, he has always been active in the community. His early employment was with “The Group”, Bermuda’s first outreach drug programme sponsored by the Government in the early 1970s. He then spent some years working at the Department of Youth and Sports assisting with the summer day camp programme, Boy Scouts, Youth Parliament and other youth groups. Scott’s concern was with young people who had difficulty adapting to society. He served on the Treatment of Offenders Board for fourteen years and more recently as a teacher at Westgate. Having lived his entire life in Pembroke, Scott welcomes the challenge of representing the constituents of Pembroke East. He and his wife Sarah, have two daughters who are both at university abroad so he knows all too well that people have hopes and aspirations and those dreams deserve the right to be realized rather than derailed through poor governance. Bermudians deserve better.